Your manuscript must be as close to perfection as possible. If not, the overly abusive critics on Amazon will rip you and your book apart in reviews, and this will dramatically decrease sales. The reviews can be so brutal on Amazon that authors are warned not to take them to heart. However, you need to avoid getting bad reviews in any way you can. Empire Publishing performs two rounds of editing. First is mechanical with academic software and then personally done by editors with a College Degree in English. 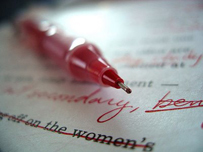 Our editors will not change your manuscript, but will make recommendations for suggested corrections. The author receives these suggested edits via “Track Changes” in the original Microsoft Word file. We recommend submitting your manuscript as a Word 2007 Doc or older. It is your responsibility to accept or reject the editor’s recommendations and make those changes to your manuscript. Our goal is not to alter your story or voice, but to enhance it for the better. The estimated time frame for most manuscripts on an average is four weeks depending on length and complexity. Manuscripts with a lesser word count (60,000 words and under) are returned to the author quicker. The Editing Service that comes with the Titanium Combo-Publishing Package is for manuscripts at 100,000 words and below. Manuscripts above 100,000 words will be charged at the rate of 1.3 cents per word. For more information about CopyEditing, click here.